♦ Leikritið var skrifað fyrir brúður sem syntu um svið Þjóðleikhússins árið 1979, í barnaleikritinu Krukkuborg eftir Odd Björnsson. Nokkrar nýjar brúður bættust í hópinn og leikritið um Sindra silfurfisk var frumsýnt á barnaleiksviði Þjóðleikhússins, Kúlunni, í lok október 2009. Sýningin var tilnefnd til Grímunnar – Íslensku leiklistarverðlaunanna 2010 í flokknum „Barnaleiksýning ársins.“ Sindri silfurfiskur hefur þrívegis verið valinn af dómnefndum til sýninga á alþjóðlegum barnaleikhússhátíðum: Sýningin var valið á barnaleikhústvíæringinn BIBU 2010 og sýnt í Lundi, Svíþjóð. Þá var hún valin á alheimsþingið og leikhúshátíðina ASSITEJ 2011 og sýnd í Malmö, Svíþjóð. Í bæði skiptin var sýningin flutt á sænsku. Árið 2011 lá leiðin til Moskvu á barnaleikhúshátíðina BIG BREAK 2011 þar sem verkið var flutt á rússnesku. ♦ Shimmer the Silverfish. 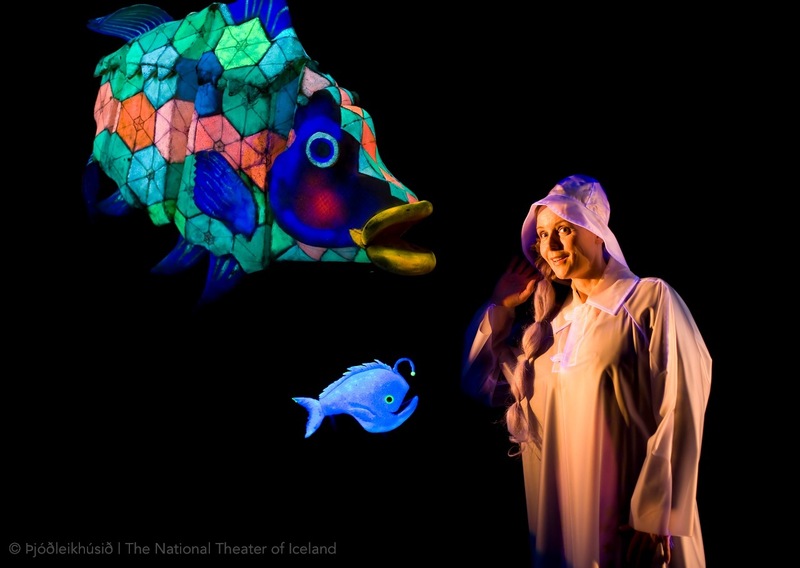 The play was written for Kúlan, the children’s theater in The National Theater of Iceland and a collection of black light theater puppets that had their origin in a children’s play by Oddur Björnsson, called Krukkuborg, in 1979. A couple of new puppets were added, like the main character: Shimmer, and a new play was premiered in October 2009. 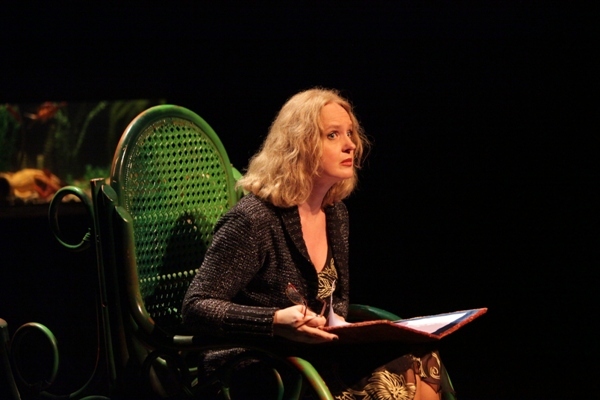 The production was nominated to Gríman – The Icelandic Theater Award as the best children’s production of the year. 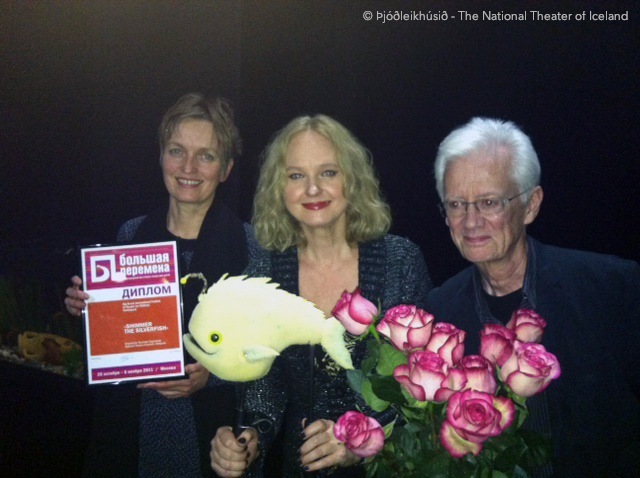 It has been selected for three festivals abroad and performed in Swedish and Russian. It was at BIBU 2010, Performing Arts Biennial for Children and Youth in Lund, Sweden; ASSITEJ 2011, The 17th ASSITEJ Congress and International Festival in Malmö, Sweden; and BIG BREAK 2011, International Festival in Moscow. Leikraddir | Puppet voices: Anna Kristín Arngrímsdóttir (Glóra), Atli Rafn Sigurðarson (Masi), Baldur Trausti Hreinsson (Kambur), Birgitta Birgisdóttir (Sindri silfurfiskur), Björn Thors (Kantur karfi), Edda Arnljótsdóttir (Karfa karfi), Friðrik Friðriksson (Þrasi), Kjartan Guðjónsson (Marinó), Ólafur Egill Egilsson (Tígull töfrafiskur), Valur Freyr Einarsson (Hákarl), Þórhallur Sigurðsson (Þorsteinn þorskur). og Þórhallur Sigurðsson leikstjóri í Praktika leikhúsinu í Moskvu í október 2011. Big Break í Moskvu – kynning á rússnesku | Big Break introduction of the play in Russian. Viðtal við leikstjóra/umfjöllun í Skånskan | Interview with the Director in Skånskan, in Swedish. 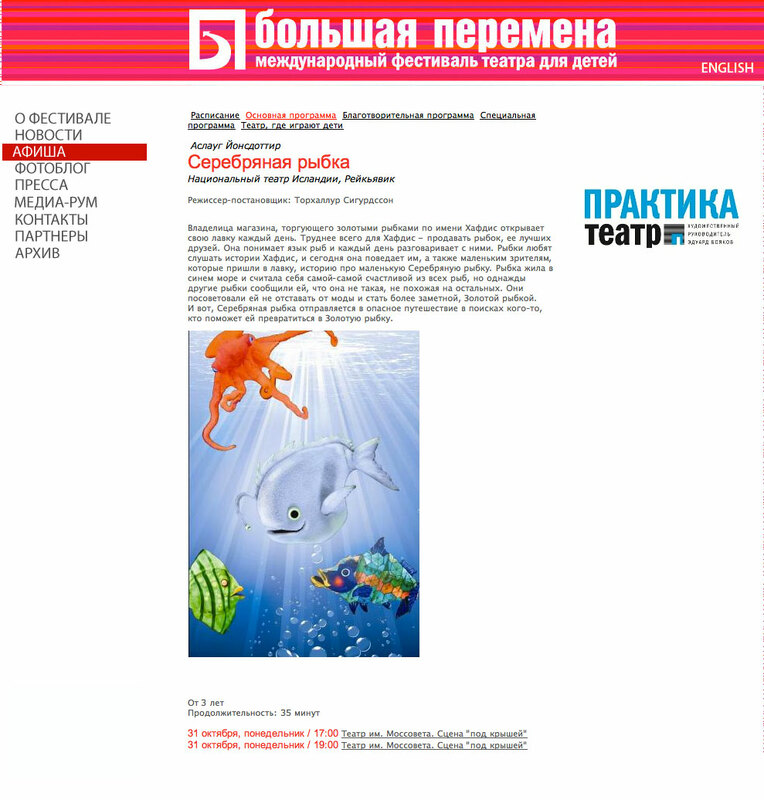 Frétt á vef Þjóðleikhússins | News from Moscow on NTI’s website.